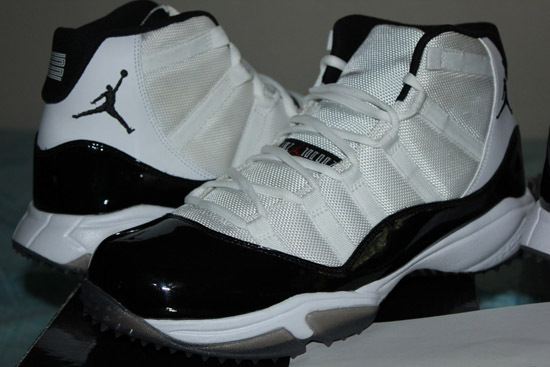 Rare Air Jordan 11 Retro Turf editions in the "Concord" and "Space Jam" colorways. Check out the auction here. Originally made exclusively for C.C. Sabathia. A few other pairs were made as well for others. These pairs came in different sizes (not just C.C. 's personal size 15) and, feature the regular number "23" on the back heel as opposed to the number "52" found on Sabathia's pairs. Select friends and family of Jordan Brand as well as JB athlete Derek Jeter received these shoes special for them. 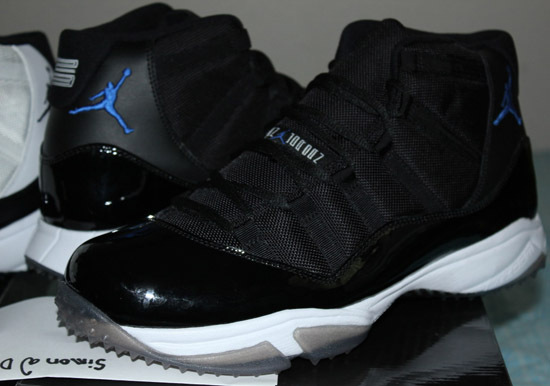 In this case, the "Space Jam" pair was made for Derek Jeter and comes in his personal size 11.5 while the "Concord" pair comes in a size 11, a promo pair. The Air Jordan 11 Retro was never released to the public in turf form. These are very rare and impossible to come by, especially pairs not made for C.C. Sabathia (even though his personal pairs are rare as well). Enjoy the images below of these two Air Jordan 11 Retro Turf player exclusives. If you're interested in adding these to your collection, click here to buy them on eBay. Air Jordan 1 Retro High OG "New York Knicks"